The songbirds and cherry blossoms of Samford University’s quad provided a strangely peaceful setting for a discussion of a human rights tragedy March 25, as the families of disappeared students called for justice in their native Mexico. In September 2014, 43 students from Mexico’s Raúl Isidro Burgos Rural Teachers' College of Ayotzinapa vanished after being attacked by police and army units near the town of Iguala and delivered to a local crime cartel. Although only one of the “Ayotzinapa 43” has been identified among the remains in a mass grave, Mexico has officially closed the case. The families of the students are deeply skeptical of Mexico’s official investigation of the crime, and maintain hope that their loved ones are still alive. They are traveling in three caravans throughout the U.S. through April to bring attention to their cause. Carlos Alemán, director of Samford’s Latin American Studies Scholars program, worked with Miguel Carpizo of Greater Birmingham Ministries to arrange the “Caravana43” group’s visit to Birmingham. Alemán said the visit serves a reminder of Birmingham’s role in the U.S. Civil Rights Movement, demonstrates the demographic growth of the Latino population in Alabama and “makes clear that Samford University is a destination point for people who are interested in discussing and learning about international human rights and social justice issues." Samford political science department chair Fred Shepherd is a noted scholar on the subject of human rights and genocide. He introduced the Caravana43 speakers at the Samford event and emphasized how their efforts fit into a larger struggle for human rights. Shepherd, who also serves as legislative coordinator for the Alabama chapter of Amnesty International, said activists throughout the world “are increasingly able to reach up and out to empower themselves by connecting with high-profile transnational human rights organizations.” The Caravana43 activists understand that, and hope to pressure Mexico’s government by enlisting the support of the Inter-American Commission, Amnesty International and the United Nations. Anayeli Guerrero de La Cruz, sister of student Jhosivani Guerrero de la Cruz, noted the absence of song in her home since the disappearance of her music-loving brother. The promise of her brother’s education became tragedy as he and other students tried to raise funds for their studies in the nearby town of Iguala last fall. She said the students had the bad luck to visit on a day when the mayor’s wife was hosting an event. Fearful of disruption, local authorities directed violence against the students before they reached the town. The subsequent arrests of Iguala authorities and discovery of a mass grave did little to quiet suspicions of an official cover-up. “They thought that they could fool us,” Guerrero de La Cruz said of the Mexican government’s investigation. She also said that the Caravana43 activists had been offered bribes to end their campaign. “It’s like we would be selling our own children,” she said of that idea. Clemente Rodriguez-Moreno also alluded to offers of bribes but vowed that the Caravana43 activists “will never be quiet” in their quest for answers and justice. Mostly, though, he spoke of his missing son, Cristian Alfonso Rodriguez-Telumbre. The father recalled the boots that still hang in a local dance hall, ready for the son’s return. He recalled the lost harvest of flowers the students had planned to sell, and a lost harvest of young people who sought to lead their country out of violent oppression. Cristina M. Almanza, director of external relations for Samford’s Leslie S. Wright Fine Arts Center, helped with the Caravana43 event logistics and media relations, but she also has a personal stake in their mission. The Mexico native expressed “the infuriating sadness of the difficulties that a once peaceful country is now facing” and noted how deeply her countrymen feel the plight of the Caravana43. “The uncertainty of the parents of the 43 is the struggle that every Mexican, whether poor or rich has come to know,” she said. 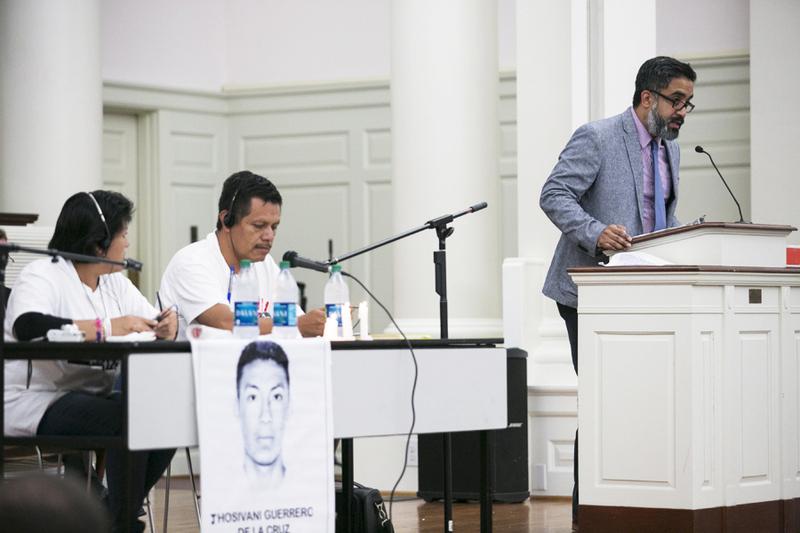 As Rodriguez-Moreno read the names of the Ayotzinapa 43, Almanza joined an audience of hundreds at Samford who answered “¡Presente!” for the disappeared and “¡Vive!” for the dead.